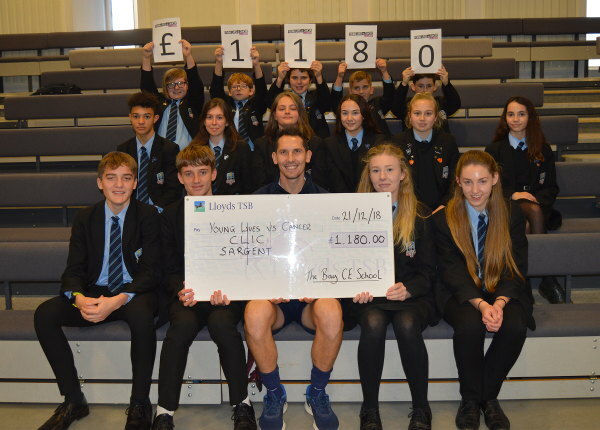 With the support of the local community and hard work of the students of the Blue House of The Bay CE School, over £1,000 has been raised for CLIC Sargent’s Young Lives v Cancer campaign. The Bay CE School held a community fundraising day on the secondary site on Friday 14th December. Students in Year 6-11 at The Bay CE School are in one of four houses; Red, Blue, Green or Yellow. The House system promotes positive competition, team building along with a sense of community and belonging. They set out with a target to raise £770: the amount it costs to provide a base for an Isle of Wight family at Jeans House while their child is being treated for Cancer at Southampton hospital. Jeans House is a ‘home from home’ and a safe haven for families to stay that is close to the children and young people’s oncology ward at Southampton General Hospital. The Blue House student council worked tirelessly to plan the day. There was a non-uniform day, mince pie bake-off and sale, a huge raffle and Challenge Santa sports events. The day ended with over 100 students and staff taking part in Blue House Quiz. The final amount raised for CLIC Sargent was £1,180. “I am really proud of the Blue House Council for all of their hard work and commitment to make the Community Day so successful.